This week we visited our local Pet Food Center to pick up some bird seed. With the weather getting colder , ma likes to stock up. They had a sale on it so off we went. When we got to the store ma decided to look around. We hadn't been there in a while so she let us sniff. I don't get to sniff very often. We found some new treats and the sales girl offered us a sample to try. I won't take a treat from anyone in a store. Scooby won't take a treat because I won't take it. Ma told the girl that she would give it to us in the car and if we liked it she would come back and buy some. 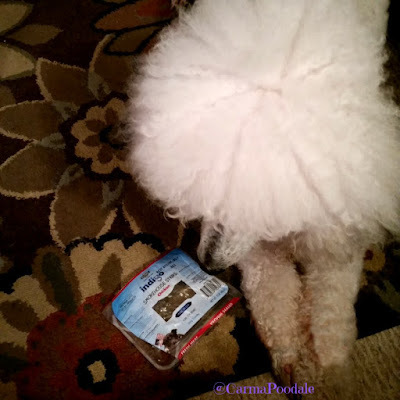 We did find a treat that I have tried before at a Blogpaws conference. 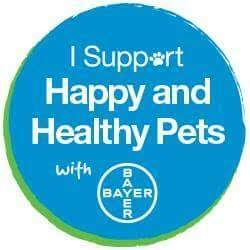 These treats are made by PetSafe and are made from ingredients in the U.S. of A. Since the store had some coupons for $2.00 off a bag, ma grabbed a couple of bags. She asked if there was a limit that she could buy while using the coupons and they told her no. She grabbed a few more and we headed to the checkout. She wanted to get a 50 pound bag of bird food and seen there were a couple of bags that were marked down to 60% off. Ma asked what was wrong with them and the girl said they had tore them getting them off the skid so they had to tape them. Ma said she would take a bag. The guy that was working loaded the bag in the car and we were happy that we got some jerky treats. Ma handed us the treats that the girl had gave us and Scooby and I scarfed them down. We got out of the car and headed back in the store. She bought us some of the treats we had just tried and she bought the other bag of discounted bird seed. She purchased 100 pound of premium bird seed for $15.00. Whatta bargain!! 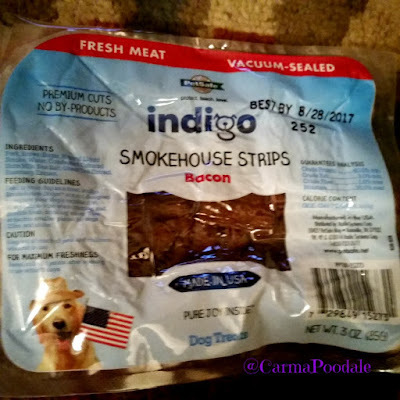 When we got home, ma opened out Indigo treats and gave us a few because we were so good in the store. I had forgotten how dewicious those treats were! Scooby Doo started dancing for more. They are the perfect size treats. Yes ma has ate one and even she agrees they have a good flavor. We got the bacon and the chickyum. Here is a shocker....I like the bacon better than the chickyum. STOP THE PRESSES! WHAT DID I JUST SAY?? YES! I like the bacon better than the chickyum. Only a little bit better so don't think I am turning my back on chickyum. The bacon flavor is made with Bacon Flavor Pork, Brown Sugar, Natural Liquid Smoke, Water, Condensed Cultured Skim Milk, Sea Salt, Green Tea Extract, Rosemary Extract. The chickyum flavor is made with Chicken, Brown Sugar, Natural Liquid Smoke, Water, Condensed Cultured Skim Milk, Sea Salt, Green Tea Extract, Rosemary Extract. After I had a few of these treats a light went off in my head. If all 3 of us enjoyed these treats then I bet you would too. Ma can I give a bad away in a contest?? I asked ma if I could have a giveaway for a bag of treats. I wish she would let me send every one of you a bag but she said she couldn't afford that but would help me host a contest. This way one of you would get a 3 ounce package of these treats and I will send you a coupon worth $2.00 off your next purchase at a store near you. Enter for a chance to win a 3 oz. bag of Indigo SmokeHouse Strip treats and a $2.00 off coupon and don't forget to share this post with your friends! I love when people share my contest or articles. The contest starts November 18th and ends on November 25. This gives you a week to enter. On the 25th of Nov. I will tell the software to pick the winner, I will email winner directly and announce winner's name on my FaceBook and Twitter pages. The winner has 48 hours to reply to my email. If they do not reply , I will pick another winner. Once I get the winner's address, I will mail the package. Good Luck and I hope you have a beautiful day. They are very tasty. I was pleasantly surprised at how much they taste like human jerky. 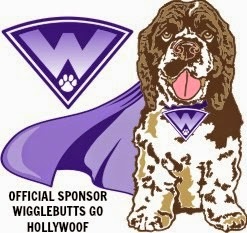 I tasted those treats after BlogPaws. They were in mom's swag bag and I sniffed them out. I LOVED them. Can't remember which flavor. She figured that out when I started doing all my tricks at once just so I could get more. BOL! I have a Boxer named Loki and I think he would love to try the bacon flavor :)! Thanks so much for the opportunity to win! The bacon is delicious. I am a chicken girl but that bacon is tops for me. Our dogs are Baby Girl and Sassy, they would love the Bacon!! 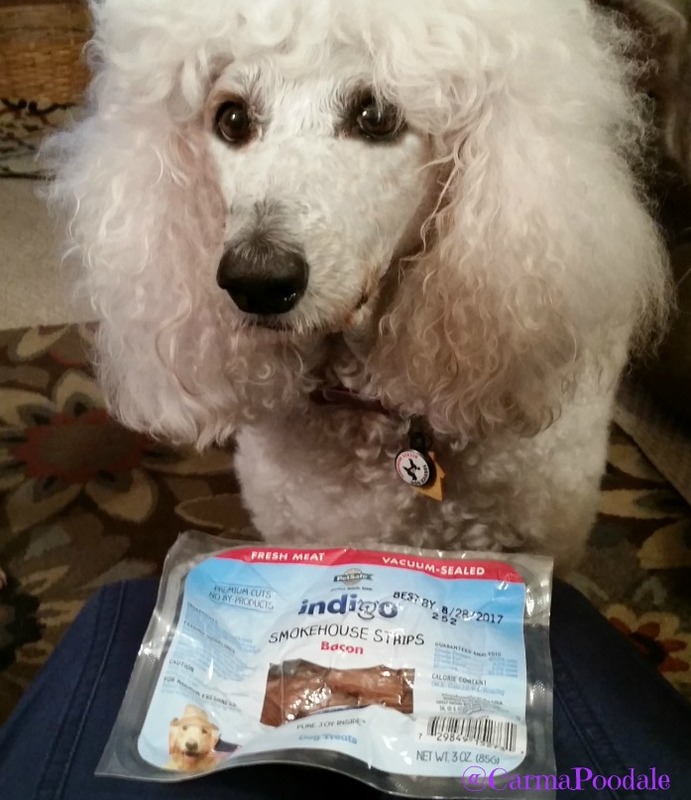 We love these treats and use them for our nose work and tracking training. All the flavors are great, but bacon, who could say no to bacon? I like the bacon better than the chickyum. I was surprised!